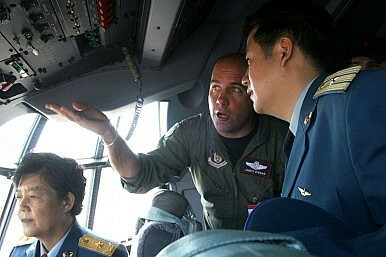 Maj. James Dignan describes some of the features of the C-130J Hercules to Chinese Maj. Gen. Yue Xicui (left) and Maj. Zhang Dezhao on May 16, 2006 at the Berlin Air Show. Last week, the U.S. Air Force issued new guidelines regulating contact with the Chinese military in an attempt to strengthen military-to-military relations between both countries. “With the rise of PRC influence in the international community and the increasing capabilities of the Chinese military, Air Force military-to-military relationship with the People’s Liberation Army (PLA), the People’s Liberation Army Navy (PLAN), and the People’s Liberation Army Air Force (PLAAF) is becoming more crucial than before,” the directive reads. In detail, the instruction regulates U.S. visits to Chinese military facilities, as well as visits of Chinese air force personnel to U.S. installations. “The success of these visits, whether US or PRC-led, directly affects relationships between the US and the PRC, as well as our relationships with our allies and partners, and is thereby important in support of national and regional politicomilitary objectives,” according to the document. Force projection operations, nuclear operations, advanced combined-arms and joint combat operations, advanced logistical operations, chemical and biological defense and other capabilities related to weapons of mass destruction, surveillance and reconnaissance operations, joint war-fighting experiments and other activities related to a transformation in warfare, military space operations, other advanced capabilities of the armed forces, arms sales or military-related technology transfers, release of classified or restricted information, and access to a DoD laboratory. Chinese officials continue to point out that FY 2000 NDAA hampers deeper cooperation on a range of issues. American and Chinese pilots fought each other during the Korean War. However, after U.S. President Richard Nixon’s visit to China in 1972 cooperation between the two service branches increased. For example, during the Cold War the USAF and PLAAF exchanged intelligence on Soviet forces and China even exported a group of J-7 fighter jets to the United States for the American military’s “Red Eagle” MIG squadron. Yet, the United States suspended all mil-to-mil contacts and arms sales in response to the violent suppression of the Tiananmen Square protests in June 1989.